It might be May, but it's never too early for a post mentioning Pitt and Penn State. In this case, the occasion is their rankings in SI's college football Top 25, which puts the Nittany Lions at #14 and Pitt at #16. "The young offensive line and young quarterbacks Kevin Newsome and Matt McGloin seemed shaky during the spring, and coach Joe Paterno called his team "average." I always get nervous that I'm ranking the Nittany Lions too low when JoePa starts sandbagging, but he's correct: They are pretty raw in some key spots. But will they get even younger? Freshman quarterback Paul Jones, an early enrollee, shined at times, and quarterbacks coach Jay Paterno hasn't shut the door on the idea of Jones competing with Newsome and McGloin for the starting job." "Dan Mason, who started two games at middle linebacker last year in place of injured Adam Gunn, could be the next star on a team loaded with them. The Panthers don't bring back a ton of starters, but some of the players they do return are elite. Greg Romeus was the Big East Defensive Player of the Year in 2009, and Dion Lewis and Jonathan Baldwin might be the nation's best back/receiver tandem." Lewis and Baldwin the nation's best back/receiver tandem? I can think of one particular person who I'd wager will disagree with that statement. But player debates aside, all signs point to this being a very exciting season for both of these teams - and in turn, some inspired arguments between both fan bases for an extended part of 2010. You forgot to report who is #1 ?!!! Who "might be" #1 you mean. I don't think its a stretch to say Lewis/Baldwin are every bit as good as Ingram/Jones if not better. It's not exactly like Jones produced last year. And before the QB argument is brought up... McElroy and Stull had VERY similar stats. Jones simply didn't produce. Give a slight edge to Ingram, but a big edge has to be given to Baldwin (twice the yards and touchdowns + 6 ypc more). There you have it... Lewis/Baldwin are the best. I would personally like to see no rankings until week 7 or 8 anyways. @ BWBW - Agreed. It's equally ridiculous that there are already mock 2011 NFL drafts out there too, but there's enough idiots into this kind of nonsense. So they're out there. To further your idea, i don't think there should be an AP poll or coaches polls AT ALL. The only ranking that 'matters' is the BCS. And that doesn't appear until... hmmm... after week 8? Well stated, BWBW. As a PSU alumn, i'm excited to see PSU predicted as #14. However the analysis seems to describe them as average at best. Is the 14th best team really just average? And TAKE THAT Pitt fans! We're ahead of you in a meaningless poll! HA! @Brian...... You can have your stats . I'll take the National Championships. # 13, Baby!! Funny you didn't mention Trent Richardson/ Mark Ingram duo.... Well, I'll let you in on another weapon.. ED LACY!! you heard it here first. WE should bring back the Wishbone! BTW, Brian, I'll leave you with some wisdom... "There are 3 types of lies. Lies, Damn Lies, and Statistics.... - Mark Twain"
I see that Adam. "PD" Championships. How does that work again... on research? BAMA has those too, Thank G-D they are already add ons to the recognized ones. Hey I have no hate for Pitt. 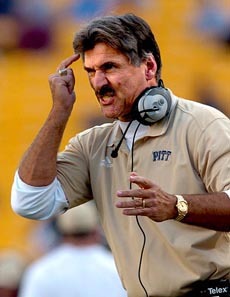 I root for Pitt before Penn State.